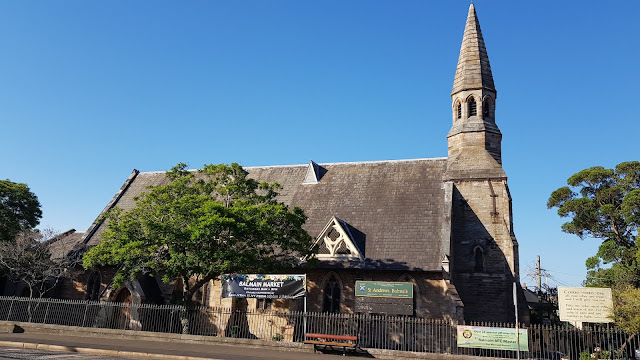 St Andrew's Congregational Church is located on the corner of Darling Street and Curtis Road, in the inner west suburb of Balmain. This heritage listed church was built in 1855 in the Victorian Free Gothic architectural style. Linked to: Shadow Shot Sunday, Sundays In My City, InSPIREd Sunday, Fences Around The World. You have found a beautiful 163 years old treasure! It's a beauty. We've got a lot of that Gothic style here, and it always appeals to me. It looks even older. Great find! What an incredible church! What is cool about it is that it is differant from the typical churches you see in Australia. Kelleyn, there are actually quite a few churches still around from this era. The charm of the rustic stone used with this church and reveals it's apparent age! Every time something new is learned - a Gothic Victorian - thank you much for sharing it with All Seasons. Have a beautiful week!